As you might remember, I made a new "door of silence", but the artist was given the opportunity to make it into another piece of art instead. -What do we want from art? -Do we want art at all? -How should the state support artists financially? -What type of art do we want? + more questions about art. Sadly I was unable to find the time to attend any of the discussions, but I did find the time to go to the meeting place and behold "the door of creation". I really like the way Anja has decorated the door, and I am proud that the community has asked her if the door could be kept in the position even after the "kulturmødet" is over. The door is the manifestation and the sum of the so far largest of my closed doors. A massive mastodon that has been milled and assembled especially for me. It came to me in the moment the silence was broken. I had named my urge of creation and its spirit. The Universe has responded with a manifestation that can't be ignored. Now the door is there, and the choice is mine. Do I want to pass though? Dare I? Can I? Am I able to? It starts with a thought. The door invites to drop all the "ought" and "should" and instead look inward, rediscover ones own power of creation and from there create an entrance and an exit. A mental journey, which is manifested in the physical World, when we are able to live as intense and confident as infants again. All keys to creation are to be found inside. On the edge between future and past. (Sorry if the translation is not entirely correct, but we weren't taught translation of philosophical stuff at the marine engineers college). My brother is visiting from Japan. (Yes, he is Danish, but currently lives in Japan). I will let him write the remaining part of this post. Hello Everyone! This is Jonas's brother Jens. I am visiting Jonas for a few days from Japan and tonight he has just taught me to make dovetails! (Tails first!) - More on this another day. We talked about an idea to sell vintage Japanese chisels, like the ones in the picture, and would appreciate your feedback on this. 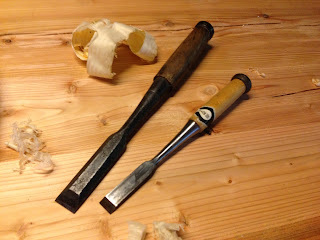 1) Would you be interested in buying vintage/antique Japanese chisels via ebay, directly from Japan? 2) Would you rather buy them as a set or as single chisels? 3) Any other Japanese vintage tools you would be interested in? 4) Would postage of about 15-20 USD for 1-2 chisels be too much? 5) Would you prefer the chisels to be cleaned/ sharpened or just buy as is? We know there is a few people selling these on ebay already (also directly from Japan) but thought there might be room for one more vendor? All comments, ideas and suggestions VERY welcome! I bought a Lie Nielsen No 1 about half a year ago, and I haven't had the time nor the opportunity to give it a proper test. But today Gustav and Asger joined me in the workshop in the afternoon, so we could move on with their different projects. Gustav's project which is a secret by the way, actually called for some planning to be done. I haven't lapped or sharpened the plane, it is straight out of the box, and I think it is OK. I will probably lap it one day, but now it was more important to move on. It seems very small, even for children to use, so I actually think that it would have been a better deal to buy a No 2 instead. Even Asger's hands are too large for the rear tote. They both liked the control they had over the plane due to its size, so that it positive. I "invented" a new project during the testing done by Asger: The children's workbench needs to be raised at least 4". I still have the original stand for it, so that should take care of it in a short time. While Gustav was planning the parts for his secret project, Asger and I did some more soldering on the truck that he started to make a while ago. We managed to finish the front part of the truck, complete with 6 wheels which we helped each other to turn on the lathe. There is a trailer hitch on the back, and he wants to make a trailer to go along with it to make it perfect. The roof is now finished on the outside, and I am trying to clear things up a bit before starting on the interior. I need to make the trim for 6 Velux windows. Which is not something I am looking forward to. But once it is done, the roof project will be finished. This workbench is too low. Gustav has just started in the 5th grade. That means that they are having lessons in sloyd. This is luckily still mandatory. I am away on my job now, but I try to call home every night to talk with the family. yesterday Gustav told that they had had their first lessons in Sloyd. He told me that they were going to make "kill and eat". Which is a Danish television program, where they take to the nature and kill something and eat it. It could be a fish or a deer or something along those lines. The idea in the sloyd lessons is that they will have to make a knife, a fork and a spoon, and then they will make a meal in the nature and use their own utensils for eating it. As far as I remember from my daughters lessons they start out with the knife which they whittle. They then make the fork by use of a small electric coping saw. The spoon is made using a gouge and the outside is sawn with the coping saw. Gustav said that he actually felt the first double lesson was quite boring since the teacher just explained the names of the different tools, and Gustav already knew those. He then told me: Dad - do you know, we are not even allowed to use an electric jig saw or the lathe! I tried to explain to him that most likely not all the other children had had the chance to use that kind of equipment, so it was probably a good idea that not everyone was just let loose in the shop. He also told me that he had straight away suggested to the teacher that they could make a cutting block. but apparently the teacher had replied that such a thing could be difficult to make. I just hope he doesn't get into trouble for wanting to move ahead too fast. But then I'll just have to make him use all his energy at home in the workshop together with me. I'll post some pictures of the finished products once they are ready. We had a drill tonight on board the ferry, and the scenario was that all the basic crew were killed in a collision , so the ship had to be evacuated by the safety crew alone. The basic crew are those of us who are actually sailing the boat and not directly handling the passengers normally i.e Captain, chief engineer, chief officer, 1st engineer and 3 able bodied seamen. The Safety crew are those crew members who have direct contact with the passengers normally: i.e. catering staff and the head of their department (food and beverage manager). Normally an evacuation is ordered and led by the captain, and each crew member has got specific duties. But this time the "head" was missing, so they had to figure out how to do it by themselves. It all went very well, and upon debriefing they all expressed that it had been an interesting and challenging drill. We felt obliged to tell them that sometimes these things actually do happen. That people who are not trained in leading evacuations sometimes have to do so because of improper behavior of those who were responsible. My deepest respect goes out to the people who led this evacuation and made sure that all passengers were saved. We have recently acquired 2 rabbits. Asger (7) originally wanted one rabbit, but we decided that it was probably a bit lonely, so one day after getting the first rabbit, we acquired another one. They are mother and daughter, so they get along very well. As described in the previous post, I acquired some elm, and one of the trunks had some rot in the top. I had cut the rotten branch into 12" sections, and I was planning on making them into fire wood. In order to activate the boys, I suggested that they removed all the rotten spongy dead wood and made those hollow pieces of wood into a tunnel for the rabbits. That seemed like the magic word. In no time there was spongy rotten elm all over the place and they were hacking away using different kinds of tools. The rotten wood gave way easily and they really liked the speed of the project and that they could see some clear progress. Once finished, the elm tunnel was installed in the stable for the rabbits to play in. Children don't mind rotten spongy wood, in fact they think that it is an advantage above normal wood. Rabbits like tunnels made out of elm. Children normally disappear before it is time to clean up the accumulated waste from the project. Coarse tools = quick results. We managed to chop down the trunks of elm and transport it home. The crane on the truck was even able to lift the trunk onto the wagon of the mule saw. So now there is no excuse for not getting started.. except finishing the roof etc. The owner of the horse training centre didn't want any money for the trunks, but he would like me to help chop down some other old elms that were leaning over their house. Those elms weren't as big and some of them were partly rotted. So I helped him and said that he could keep the wood for fire wood. He was really pleased, and so am I. So without any further delay here is a small graphic description of a nice day. Gustav next to one of the trunks. The tree next to the trusty Volvo Valp. One of the branches was rotten inside. The bottom of the trunk. Getting the log onto the mule saw. Yesterday our local horse training centre had its final day. For the last 36 years there have been an incredible amount of children who have had their skills honed on horses and ponies. But due to the age of the owners and the new legislation regarding horse keeping, the owners decided to call it quits. We went to the closing reception yesterday afternoon to have a chat and say a proper farewell. Gustav (10) was pretty emotional about it since he had classes there every Friday. During all the sandwiches, beer and coffee, I suddenly realised that there were two large trunks of elm standing in the small garden. Even though this was neither the time nor the place, I decided to ask Jan the owner, if I could buy those two trunks. He said that he had actually given them away earlier, but that guy had never done good of his promise. I decided to move swiftly on this project to avoid someone else getting their hands on the nice trunks and transforming them into firewood. Luckily my neighbour has got access to a truck with a crane, and he willingly offered to help with the transport. So in 1 hour Gustav and I will drive out and do some logging. And at 10 o'clock the truck will be there for the pick up and haul the wood straight home to the sawmill. Hopefully this will provide a lot of wood for Welsh stick chairs and probably also for some other things.